A store locator app, customized for your website. Simple setup, fully customized & no coding, from just $25/month. Learn more about how each store locator can be matched to your website theme, fonts, colors & much more - included free with all plans! Storepoint store locator app works flawlessly across all website platforms and custom websites. Our one-step copy-and-paste installation makes it easy to get up and running in minutes. What makes our store locator unique? 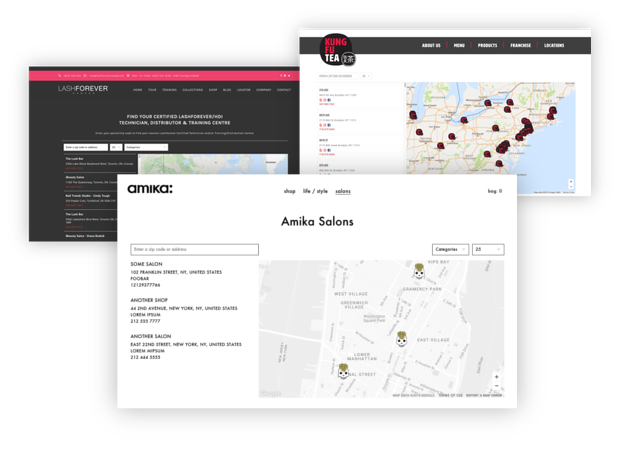 Besides the many customization settings available in the dashboard, our team can customize every detail of your store locator to fit your website's design - included free with all plans & no coding required whatsoever. If you have custom functionality requirements, we can make it happen. Designers: You can edit your own CSS as well! 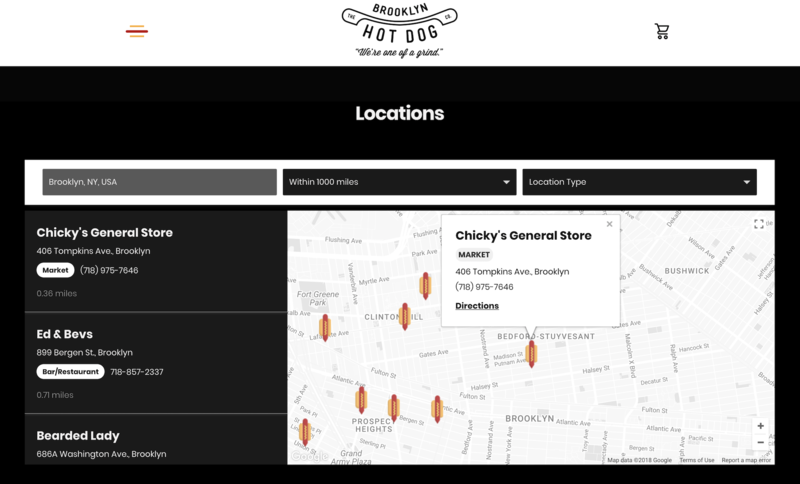 Besides looking great, your store locator needs to be easy to use and manage. Add and edit locations easily using our management dashboard. Fast and easy Bulk upload from CSV or sync from Google Sheets. Works and looks great on all computers, tablets, smartphones. Customize your store locator without touching any code. CSS editor available as well! Help customers filter by product, categories or location type. Instantly show the locations closest to your web visitors. Setup your locator in minutes. No coding required. Storepoint locator works with locations anywhere in the world. We're here to help you, from setup, to management, to customization. Got ideas? We'll work with you to build out custom features & functionality. Setup your store locator in minutes. 3. Copy-paste once into your website and you're all done! 4. Manage locations in Storepoint and they will automatically update in your locator. Not ready yet? Explore our examples or schedule a call to chat about your project. "From first click of purchase to final product was about 15 minutes of chatting with Jake. He created a beautifully customized map with basically no direction. I'm a stickler for design and the product is beautiful. Highly recommend." "Happy new subscriber - Great platform, easy to use and excellent service!" "It looks awesome! Thank you so much! It looks great on my iPhone as well. Great product and service :)"
7-day free trial. Cancel anytime. Enterprise Solutions: Please contact us to discuss capabilities. 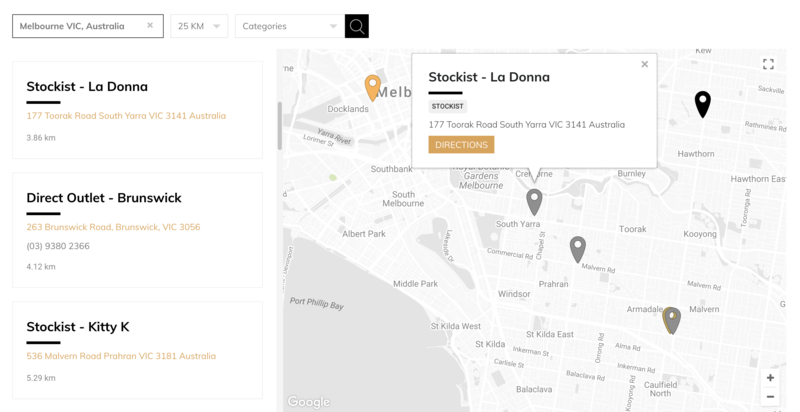 The easiest way to create a beautiful, fully customized store locator app for your website.